Former Supreme Court Justice Sandra Day O'Connor says she has been diagnosed with "dementia, probably Alzheimer's disease." She's seen here in 2012. Sandra Day O'Connor, seen here testifying before the Senate Judiciary Committee in 1981, served for 24 years on the Supreme Court. 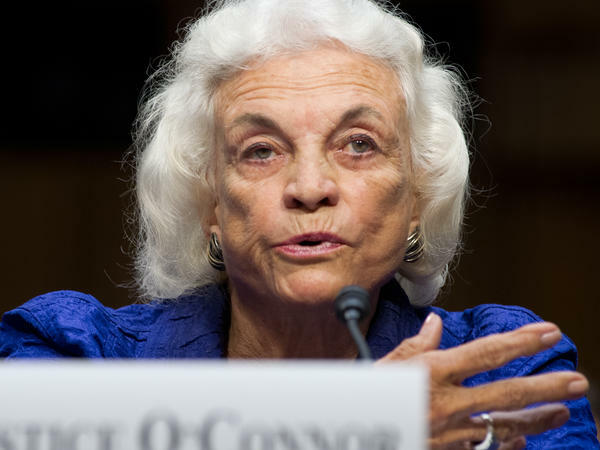 Retired Supreme Court Justice Sandra Day O'Connor says she has been diagnosed with "the beginning stages of dementia, probably Alzheimer's disease," in an open letter that was released Tuesday. O'Connor, 88, is the first woman to serve on the high court and has remained active since retiring in 2006. She left the court to care for her husband, John, after he was diagnosed with Alzheimer's. Now, O'Connor says, her condition is forcing her to withdraw from public life. "While the final chapter of my life with dementia may be trying, nothing has diminished my gratitude and deep appreciation for the countless blessings in my life," she writes in a letter released by the Supreme Court's public information office. "As this condition has progressed, I am no longer able to participate in public life," O'Connor says. "Since many people have asked about my current status and activities, I want to be open about these changes, and while I am still able, share some personal thoughts." In her letter, O'Connor then describes the importance of encouraging the growth of Americans' civic learning and engagement — a key goal of iCivics, the organization she started after retiring from the federal bench. Concluding the letter, O'Connor writes, "While the final chapter of my life with dementia may be trying, nothing has diminished my gratitude and deep appreciation for the countless blessings in my life." O'Conner's dementia diagnosis is a cruel echo of her reason for leaving the court. She retired in 2005 because of her husband's Alzheimer's and her desire to be with him while the two were still able to enjoy each other. But he deteriorated far more rapidly than expected, was unable to remain at home, and died in 2009. O'Conner has for several years limited her public appearances and, to those who knew her, it was clear that she was having difficulty walking and sometimes remembering. This summer her sons packed up her Supreme Court office, which she maintained in retirement, to allow Justice Anthony Kennedy, who retired in July, to move in. Responding to O'Connor's letter, Chief Justice John Roberts writes, "I was saddened to learn that Justice Sandra Day O'Connor, like many Americans, faces the challenge of dementia." He adds, "But I was not at all surprised that she used the occasion of sharing that fact to think of our country first, and to urge an increased commitment to civics education, a cause to which she devoted so much of her time and indomitable energy." Calling O'Connor "a towering figure in the history of the United States," Roberts says, "She broke down barriers for women in the legal profession to the betterment of that profession and the country as a whole." The former justice has been "a role model not only for girls and women, but for all those committed to equal justice under law," he says, adding that "no illness or condition can take away the inspiration she provides for those who will follow the many paths she has blazed." The other justices, especially those who served with her, issued statements remarkable in the warm and personal way they talked about O'Connor. Justice Clarence Thomas calls her "the embodiment of kindness, dignity, and civility." She is, he says, "truly a wonderful person." Justice Ginsburg says O'Connor "has done more to promote collegiality among the Court's members and with our counterparts abroad, than any other justice, past or present." "I miss your warmth, your sense of humor, that Western touch, and of course your legal mind," writes Justice Stephen Breyer. "You, my friend, will take your place in history, not just as the first woman appointed to the Supreme Court, but also, as one of its greatest justices." When President Reagan nominated O'Connor to the court in 1981, it was the fulfillment of a campaign promise. In an era when few women were judges, and even fewer were conservative judges, Reagan reached down to the intermediate-level state appeals court in Arizona to find the woman he would select to fill the vacancy left by retiring Justice Potter Stewart. Describing what it was like to be the first woman on the Supreme Court, O'Connor told NPR's Terry Gross in 2013 that she felt "a special responsibility" to perform at a level that would keep the door open for more women to follow her. 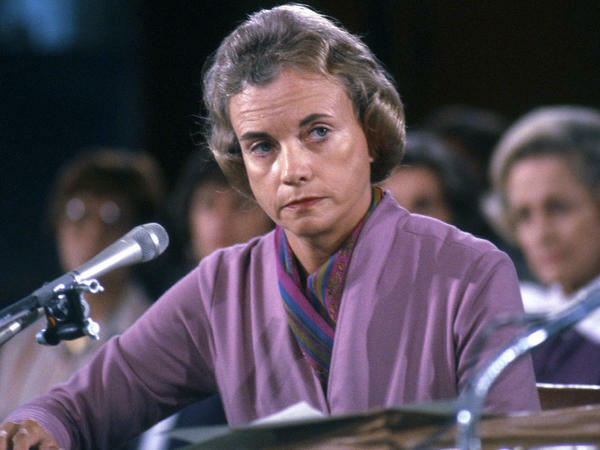 For nearly a quarter century, O'Connor served on the nation's highest court, casting votes so pivotal on controversial issues that she was often called "the most powerful woman in America." She cast votes to uphold the rights of women to have abortions, the right of Congress to regulate campaign finances, the rights of states in some conflicts with the federal government, and the rights of enemy combatants to challenge their detentions. Her colleagues frequently noted that O'Connor had, what one justice called a "pitch perfect" political ear, a sense for how far the court could go and retain the public's confidence. That may well be because O'Connor, prior to being a judge served as an Arizona state senator, including a term as Republican Senate leader, before being appointed a state judge. In her first years on the job, O'Connor has acknowledged, she was forced to deal with both the high court's tough workload and the intense public scrutiny of being its only woman. When Justice Ruth Bader Ginsburg arrived in 1993, "it was just night and day," O'Connor told NPR's Nina Totenberg in 2003. "The minute Justice Ginsburg arrived, the media pressure was off — I think for both of us. And we just became two of the nine justices. It was just such a welcome change." O'Connor rose to the heights of the legal profession despite an extra hurdle upon graduating from Stanford Law School: None of the more than 40 law firms she called would talk to her because they didn't hire women. "And it just came as a real shock because I had done well in law school, and it never entered my mind that I couldn't even get an interview," she said on WHYY's Fresh Air. As a justice, O'Connor was often called a "swing vote" — a label she viewed with distaste. "I don't think any justice — and I hope I was not one — would swing back and forth and just try to make decisions not based on legal principles but on where you thought the direction should go," she told NPR in 2013. Like it or not, O'Connor was seen as having cast the decisive votes in a number of important cases, ruling on matters from the Bush v. Gore case to the McCain-Feingold campaign finance law and colleges' use of affirmative action in admissions policies. "I will continue living in Phoenix, Arizona, surrounded by dear friends and family. While the final chapter of my life with dementia may be trying, nothing has diminished my gratitude and deep appreciation for the countless blessings in my life. How fortunate I feel to be an American and to have been presented with the remarkable opportunities available to the citizens of our country. As a young cowgirl from the Arizona desert, I never could have imagined that one day I would become the first woman justice on the U.S. Supreme Court." In 2009, O'Connor was awarded the highest civilian honor in the U.S. — the Presidential Medal of Freedom — by President Barack Obama.